We have marked a distinguished position by manufacturing, exporting and supplying a wide assortment of Thank you Printed Plastic Bags. Offered bags are beautifully designed and manufactured by utilizing the finest quality raw material with the help of modern techniques in compliance with set industry norms. These bags are mainly used for carrying gift items. 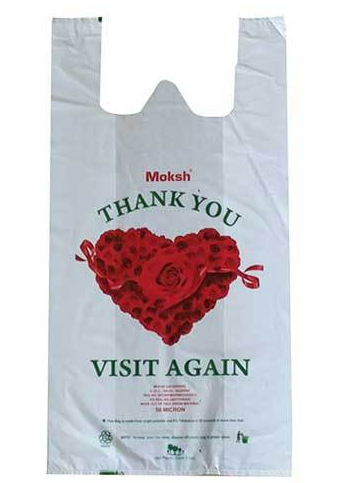 In addition, these Thank you Printed Plastic Bags can be availed from us in various elegant designs, prints and sizes as per the specific requirements of the clients. We, Moksh Enterprise, are an eminent Manufacturer, Exporter, Importer and Supplier of Packaging Material. It is all due to our high-end designing job work along-with stringent quality testing procedures on a regular basis that we are able to produce Grade-A products such as Plastic Bags, Shopping Bags, Plastic Carry Bags, Plastic Shopping Bags, Polythene Bags and D Cut Bags. All these products hold high brand value in terms of finish, design, weight and durability, which keeps them on high demand. Moreover, we offer customized solutions to customers, wherein they are given the option of choosing their preferred range of products. The sole mission of the company is to work as per prevailing market trends and serve customers within the stipulated period. Established in the year, 1987, we have been continuing the hard work and facing all the market challenges with result bound solutions. Right from procuring quality raw material to the final delivery of finished products, we carry all the job works with high-end precision and make sure to execute them as per international quality standards. There is a team of experienced professionals, who works round the clock and achieve their targets in the said time frame. All these have helped us to grow rapidly irrespective of the stiff market competition.